Xilisoft iPhone Magic Platinum enables you to backup all multimedia files in iPhone to computer or iTunes, move files from computer to iPhone, convert DVD movie, common video and audio files with no requirement for installing any other decrypter or decoder software, download exciting online videos from top online videos websites, extract audios to make personalized iPhone ringtones from audio/video files and etc. 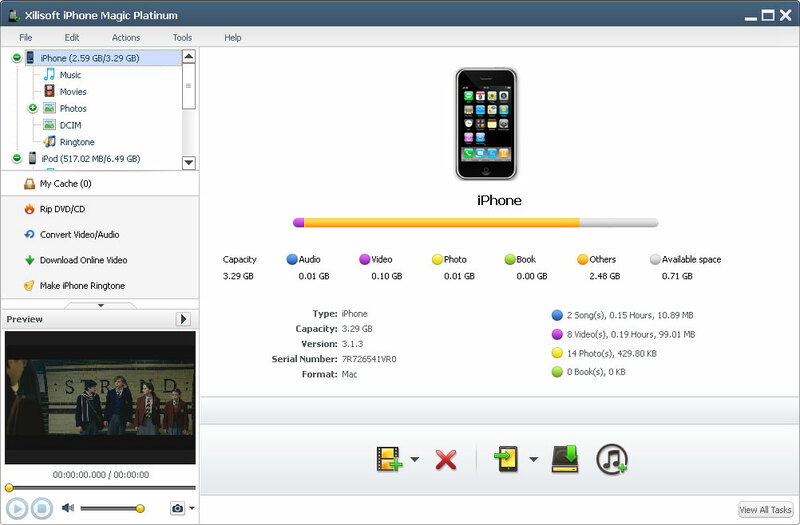 2.Backup all files in iPhone to iTunes library, support iTunes 10 well. The ultimate solution that deals with all of your conversion needs. Qweas is providing links to Xilisoft iPhone Magic Platinum 4.0.0.1228 as a courtesy, and makes no representations regarding Xilisoft iPhone Magic Platinum or any other applications or any information related thereto. Any questions, complaints or claims regarding this application Xilisoft iPhone Magic Platinum 4.0.0.1228 must be directed to the appropriate software vendor. You may click the publisher link of Xilisoft iPhone Magic Platinum on the top of this page to get more details about the vendor.